Agartala is the capital of the Indian state of Tripura and is the second largest city in North-east India after Guwahati, both in municipal area and population. Description of Activities: After breakfast visit State Museum, Tribal Museum, LaxminarayanTemple ,RabindraKanan, Fourteen Goddess Temple &Portuguese Church . Evening free for leisure . Overnight at Agartala . After breakfast day excursion to NeerMahal . 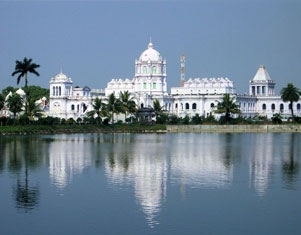 53 KM away from Agartala .This magnificent lake palace was constructed as a summer resort, in 1930by late Maharaja Birbikram Kishore ManikyaBahadur in the middle of a natural lake called Rudrasagar having an area of 5. 35 Sq.Km. Theconstruction was undertaken by Martin & Burn Co.and it's the only lake palace in the entire eastern India. Overnight at Agartala . After breakfast day excursion to Sepahijala (25 KM away from Agartala) is covering an area of 18. 532 Sq km. More than 150 species of residentialbirds, migratory birds, orchid garden, boating facilities, wild life, botanical garden, zoo, elephant joy-rides, rubber and coffee plantation attracts thevisitors , The famous spectacled monkey is found here . Overnight at Agartala. DAY 5 : AGARTALA AIRPORT DROP. Transfer to Airport to connect flight to onward destination. - Tour Ends .